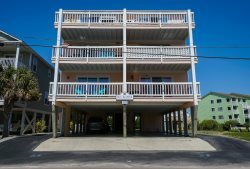 Big Blue is a very nice 4 bedroom 3.5 bathroom Carolina Beach vacation rental with great ocean views and easy ocean access. Located in the middle of Carolina Beach, this is the perfect location as you can walk to the boardwalk, lake park, restaurants, ice cream shops, bars etc.. and sit and watch fireworks from your front porch every Thursday night in the summer! Features include hardwood floors, granite counter tops, tiled bathrooms, built-ins in the living room, 2 porches, and great ocean views. The unit has a garage equiped with beach toys, beach cart, and beach chairs. Big Blue is nicely furnished and has everything you will need for a perfect vacation at the beach!